Indian handloom made its way to ancient Egypt and Rome! Vividly dyed textile fabric from India was so prized that it adorned the royalty as far back as over a thousand years B.C.!! Weaving in India has a very long tradition, predating the coming of the Aryans. People wore woven cloth during the Indus Valley Civilization in the 2nd millennium B.C. Skip a few thousand years, and Indian weaving skills reached their pinnacle during the Mughal era . Indian weavers excelled with both silk and cotton. Varieties of weaves – intricate brocade (use of silver and gold thread- “zari”), ikkat (tie-and dye of the yarn before weaving), and zardozi embellishment (embroidery using zari with precious and semi-precious stones) were churned out by Indian weavers. But the pride of place belonged to the famous muslin, a fabric so fine that a 6 yard sari could pass through a ring. The Muslin was the first weaving style that firmly entrenched the Bengal Handloom weaver into the international hall of fame, so to speak. Nobody else in the world could weave so fine a fabric as the muslin, and nobody else can till date. Weaving with 600-count yarn is child’s play for the skilled muslin weaver even to this day – and that means 600 twists in one inch of hand-spun yarn! No spinning machine can twist such fine yarn – and no mechanized loom can handle anywhere near the fine yarn used to weave the muslin. The yarn would snap before an inch has been woven. 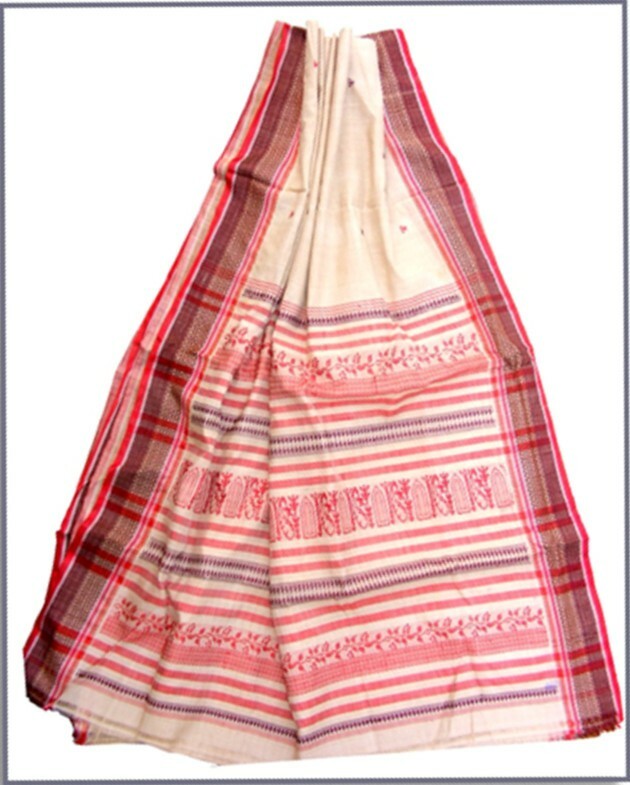 Equally renowned was the Jamdani Sari, literally a work of art. A Jamdani weaver may use scores of spindles as fine as needles – and conjure magic with unique ‘buta’s woven into the cloth that could rival the most intricate embroidery. The hallmark of the Bengal style was understated elegance and high aesthetics combined with extraordinary technical finesse. How these artisans managed to visualize such intricate designs without the use of graphs is anybody’s guess. Much of these skills were lost during British colonial rule spanning nearly two centuries, whether by design or due to circumstances. How did that happen, do you ask? Stay tuned for the answer!! Hi Aditi – Many thanks for stopping by my blog. Incidentally, I am a great fan of the Saree and do mourn its passing from regular use, at least among young women in urban India. Actually I hate the salwar-kameez which seems to have invaded and overthrown the saree, although I am told that this is a male chauvinistic view, considering the utilitarian value of the garment for the active, working woman. But then.. . Anyway, here is a post I did on clothes that you might find interesting. Hmm… that’s an interesting idea for a new post – the saree vs. the salwar kameez! Truth to tell, I myself prefer wearing the salwar kameez, and would love to watch rest of womanhood in sarees: you see, I design sarees most of all!